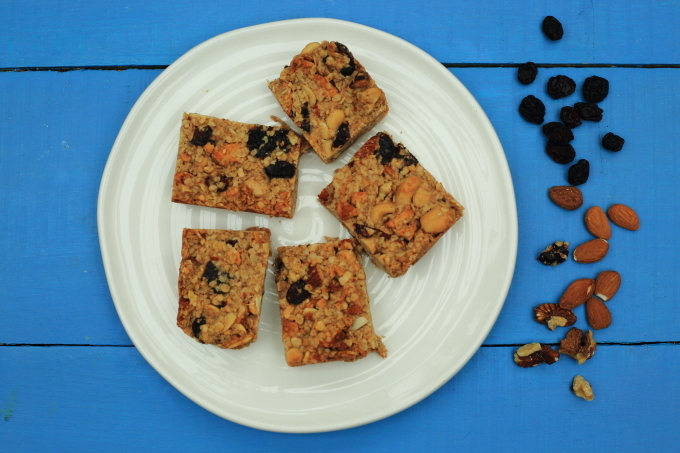 These granola bars are a great post-workout or after-school snack. They are packed with healthy fats and fibre, and are vegan and refined-sugar-free too. Not exactly diet food, but they’ll keep you full for ages. The recipe is really flexible – I use it as an opportunity to use up any dried fruit and nuts I have sitting around. Just choosing one type of each would be more elegant, of course, but that’s not exactly what these chunky bars are about. Pre-heat the oven to 170C. Grease and line a small brownie pan – mine is 20cm x 20cm (8in x 8 in). The smaller the pan, the thicker the granola bars – which is a good thing, but you may need to adjust the cooking time. Mix together the oats, flour, salt, cinnamon, fruit and nuts in a large bowl. Gently heat together the nut butter, vanilla essence, maple syrup and coconut oil. Stir well, then combine with the dry ingredients. Tip into the prepared tin. With damp hands, press down on the mixture until it is really compacted– every air pocket will cause a crack when you try to cut the bars, so keep pressing! Push the mixture well into the corners of the tin too. Bake for 20-25mins, until the bars just start to brown on top but are still soft when you press gently on the top. Leave to cool then pop into the fridge so they get really cold before you take them out of the pan and slice into small bars. I get 12 granola bars from this sized tin. These look good and I will try them for my dairy-free grandson but I think I will replace the coconut oil with something else as it’s saturated fat and my husband will no doubt eat them too! Thanks Maureen – do let us know how you get on. The good thing about coconut oil is that it is solid at room temperature so hold things together better. I would try increasing the nut butter by 2tbs and just use 2tbs of a light vegetable oil.